The Chinese city of Yumen in the northwestern province of Gansu has been sealed off and 151 people placed in quarantine after a man died of the bubonic plague — the bacterium responsible for some of the worst blights in human history. China Central Television (CCTV) is reporting that the 30,000 people of Yumen are not being allowed to leave, and police at roadblocks on the perimeter of the city are telling motorists to find alternative routes. The China Daily newspaper says four quarantine sectors have been set up in the city. "The city has enough rice, flour and oil to supply all its residents for up to one month," CCTV added. "Local residents and those in quarantine are all in stable condition." Thankfully, no further plague cases have been reported. It all started last week when a 38-year-old man died after he had been in contact with a dead marmot — a small furry animal related to the squirrel. The bubonic plague is a bacterial infection known for the Plague of Justinian and the Black Death, the latter of which killed tens of millions of people in 14th century Europe. 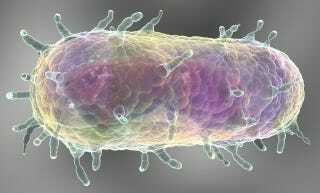 The culprit is Yersinia pestis, a bacterium that can infect humans and other animals. Disturbingly, a Lancet study from earlier this year made the claim that the Black Death could happen again. "If the Justinian plague could erupt in the human population, cause a massive pandemic, and then die out, it suggests it could happen again," noted one of the researchers. "Fortunately we now have antibiotics that could be used to effectively treat plague, which lessens the chances of another large scale human pandemic." Indeed, the U.S. Center for Disease Control says modern antibiotics are effective in treating plague, but that without prompt treatment the disease can cause serious illness or death. Clearly, the Chinese aren't taking any chances.